Bogota: Colombia will free some imprisoned ELN guerrillas so they can take part in peace talks due to open on 27 October, a facilitator said on Tuesday. The released rebels "will act, and have already been acting in some cases, as promoters of peace," said the archbishop of the Colombian city of Cali, Dario Monsalve, who is facilitating negotiations between the government and the leftist guerrillas of the National Liberation Army (ELN). The government and ELN, Colombia's second-largest rebel group, will hold talks in the Ecuadoran capital Quito, they announced on Monday. 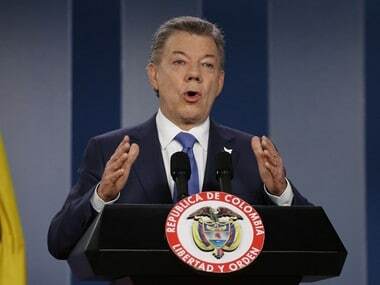 The news comes as President Juan Manuel Santos seeks a definitive peace deal with the country's largest rebel group, the Revolutionary Armed Forces of Colombia (FARC), after voters narrowly rejected an initial deal in a referendum. Santos, who won the Nobel Peace Prize last week for his efforts, has staked his legacy on ending a half-century conflict that has killed more than 260,000 people and left 45,000 missing. Monsalve did not say how many ELN members would be released. The rebels in question are "experts on the regions" where the guerrillas are active, he told Caracol Radio. He said around 500 ELN members are currently in Colombian prisons. The ELN has freed three civilian hostages in recent days — a pre-condition set by Santos for opening talks. Authorities say the rebels are still holding at least two hostages. They have pledged to release them before talks begin. The FARC also released all its hostages before opening peace talks with the government in 2012.